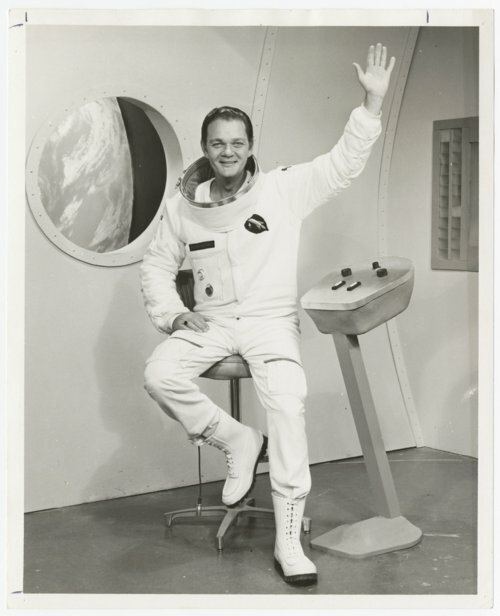 Here are two photographs of Tom Leahy, Jr., who portrayed Major Astro on Wichita television station KARD from 1962 to 1973 and revived in 1985 on KSAS. He portrayed the spaceman who traveled the universe to bring children the finest cartoons and serials. Leahy was a popular fixture in Wichita broadcasting for many years. Prior to his stint at KARD in the 1960s he gained notoriety as the macabre "Host" on "The Host and Rodney" on rival Wichita station KAKE. The Saturday late night show featured the finest in B-movie horror films. Leahy was honored for his long career as one of Wichita's most popular radio and TV personalities.